Interviewer: Welcome to Flippening the first and original podcast for full-time, professional, and institutional crypto-investors. I’m your host Clay Collins. Each week we discuss the cryptocurrency economy, new investment strategies for maximizing returns, and stories from the front lines of financial disruption. Go to flippening.com to join our newsletter for cryptocurrency investors, and find out just why this podcast is called Flippening. Interviewee: Clay Collins is the CEO of Nomics. All opinions expressed by Clay, and podcast guests, are solely their own opinion [00:00:30] and do not reflect the opinion of Nomics or any other company. This podcast is for informational and entertainment purposes only, and should not be relied upon as the basis for investment decisions. Interviewer: Hey, this is Clay. We’re just about to get into this conversation, but before we do that, I wanted to provide two announcements regarding nomics.com, the company that produces and funds this podcast. Announcement number one is that the development of nomics.dom is about to kick into high gear, so heads up to the hundreds of folks who have made [00:01:00] feature requests for the website. We hear you, we’re grateful that you use the site, and are invested enough to be making feature requests in the first place. To my knowledge, someone on our team has responded to every single request that’s been sent in. We hear you, and we’re excited to announce that we’ve recently hired a head of front-end development, his name is Tyler, and he’s coming to us from target.com where he led, among other things, the creation and implementation of site-wide user tracking systems for one of the most [00:01:30] heavily trafficked sites on the internet. Before that, I worked with Tyler at my previous company, and Tyler is hands-down one of the best engineering leaders I know, so all of this is to say that many of your feature requests are about to get prioritized and executed. Great things are coming. Stay tuned. Announcement number two is that nomics.com, and the Nomics API have launched a deep-data integration with IDEX. With over 220,000 total [00:02:00] users, IDEX is the most popular decentralized exchange by volume, and is consistently the number one Ethereum DApp in the world by daily users, volume, and transactions. It has more transactions than Bancore, and all the Zero-X relayers. If you’re listening to this, the partnership is live, so go to nomics.com check it out, or check out our Twitter feed, or blog, or Telegram group at nomicstelegram.com to learn more about this partnership. And if you’re an exchange that would like to partner with us, please go to contactnomics.com and drop us a line. [00:02:30] Now to our regularly scheduled program. Today’s conversation is with Sam McIngvale who heads up Coinbase Custody. Coinbase Custody’s clients include Polychain Capital, Multicoin Capital, who we’ve had on this podcast by the way, Autonomous Partners, and Walden Bridge Capital. Their mission is to make digital currency investment accessible to every financial institution and hedge fund in the world. Before Sam was running Coinbase Custody, he was VP of engineering at Apex Clearing Corporation. [00:03:00] As side note, I’ve been to several crypto-conferences for institutional investors and heard a bunch of really boring conversations about custody; this is not one of them. In this episode we discuss, 1) Sam’s Wall Street background and experiences working with Apex Clearing, and Equities Custodian, with customers like Betterment, Wealthfront, and Robinhood. 2) Why custody in the traditional financial world is a solved problem, and a commodity, and why things are so much more difficult when it comes to crypto- [00:03:30] assets. 3) The spectrum of options and dimensions that exist for solving the institutional custody problem with regards to crypt-assets. 4) Coinbase’s regulatory posture. 5) Why Coinbase Custody has structured itself as a clearing broker dealer, instead of a trust. 6) How Coinbase skills key management, key generation ceremonies, and thinks about security. 7) Insurance coverage of crypto-assets at Coinbase. And 8) Why Coinbase [00:04:00] is going to great lengths to separate its various institutional offerings. Sam is absolutely on point throughout this entire interview, and this conversation results in a fantastic episode that will likely leave you with much to consider. I should mention that if you want to discuss these topics, or this podcast episode, feel free to join us on our Telegram group at nomicstelegram.com. I should stop for a moment to tell you that this episode is made possible by the generous support of [00:04:30] pandaanalytics.com. If investing is not your full-time job but you still want to get into crypto and Blockchain, what cryptocurrency should you consider when making an investment decision? One popular solution is a portfolio of crypto-assets selected and rebalanced on a regular basis. I’ve had the opportunity to personally review what they’re doing, and I like it a lot. Panda Analytics essentially has three tools. The first tool is a DIY crypto-index fund creator, where you fill in a bunch of variables and they create a customized indexing strategy [00:05:00] for you, that you execute. The second product is basically the same as their do-it-yourself index creator, except they execute the trades for you on an exchange of your choice. Their third product is a fully-managed index fund. I’ve spent some time speaking to their CEO and they have my endorsement. If you want to learn more about their index fund and tools, please check the website at pandaanalytics.com. Okay. Let’s get this conversation started, here without further ado is part one of [00:05:30] my conversation with Sam McIngvale from Coinbase Custody. Sam, can you describe for us the journey, and the path that led you to heading up Coinbase’s custody initiative? Interviewee: I’m actually a late convert to the crypto space. I had to sort of have it beaten into my over some [00:06:00] amount of time. I bought some Bitcoin in 2015, sold it soon thereafter thinking it would be one of the better investments I’ve ever made, and obviously continued to regret that to this day. But I actually come to the space from Wall Street. My first five years I was a software engineer, sort of right out of school, went to school for computer science. Worked at a high frequency proprietary hedge fund in Chicago, so wrote prop trading algorithms and systems for the first five years of my career, and ended up running a small tech group there. Ultimately wound up running engineering [00:06:30] and product at a equities custodian called APEX Clearing. APEX is notable because it is the tech stack and a lot of the pathway into financial markets for some really well-known equities wealth management apps. Robinhood would be the biggest name, Betterment, Wealthfront are some others. A group that’s near and dear to my heart called M1 Finance. So we had a lot of fun servicing those groups. We also built product that scaled to Goldman, Prudential, Capital One, all of their retail wealth offerings as well. So the last two [00:07:00] years at APEX I ran product and bus. dev. there. I actually launched a small prime brokerage too as part of that effort too, which was fun and taught me a bunch. Sort of through the FEN-TECH angle, the FEN-TECH clients that APEX served, I got introduced to Coinbase, and luckily got to chat with Brian Armstrong, the CEO, and Jeremy the chief product officer, right about the time they were thinking about custody last November. And great timing, the conversations seemed to just really … I think the way we were thinking about the space really lined up from the start. I’d had a little time to think [00:07:30] about it, and prep for those conversations, and the end result was I was running Coinbase Custody a couple months later. Interviewer: I’d like to back up and just understand a little bit about what you did at APEX and the customers. You mentioned a lot of heavy hitters. Was APEX like a custodial back office that served these customers? Could you just describe a little bit more about what all you did there. Or what that product was. Interviewee: APEX is effectively a stripe for financial markets. So we used to just call it a sophisticated API [00:08:00] for access to US equity markets. Really APEX is a custodial back end, with a restful API on top. And I think the thing that I learned the most from APEX, and that I carry a lot with me in the crypto-space, is that custody in the equities world … and I’ll say “equities world” throughout the interview, I just mean more traditional finance … it’s a complete commodity. In most cases it’s actually given away. It’s not something anyone understands, knows about, cares about. Pretty much [00:08:30] from the 1960s it’s just been a word that people occasionally use. People think in the equity space in terms of, really prime brokers, and/or correspondent client firms. That’s how most funds and brokerages like Robinhood get access to financial markets, and store their customers’ securities. So it’s sort of funny that we have to talk about custody so much in the crypto space when it’s really this abstract notion that I think most people don’t even understand why or how it exists in the equities world. Interviewer: Moving to Coinbase a little bit, Coinbase [00:09:00] has been doing custody from day one. What’s different about what you’re doing? You know with respect to everything else that Coinbase is doing holding customer’s funds for … what, five years now? Four years? Interviewee: Six years now actually. Our six-year anniversary was just a few weeks ago. Interviewee: Yeah. Pretty fun. So there’s a couple key differences. Ultimately Coinbase Custody is an evolution, and an iteration of everything Coinbase has learned about securely storing [00:09:30] crypto-assets over the past six years. And one of the things that’s cool is we’ve had a really large target on our back throughout that time, so we’ve been forced to … for the most part, be best in class, to avoid any substantial breaches. And Coinbase is very proud that on the retail side, no funds in our vault has ever been lost. So what we did for custody was take all of those learnings, all of that sort of institutional knowledge we’ve built up, and iterated it and built a new version of it that is Coinbase Custody. Specifically the biggest advantage Coinbase Custody brings, [00:10:00] is it’s built for institutions, and what I mean by that is it starts off, everything is segregated. So if you are a fund and you have a Coinbase Custody account, you will get your own sort of asset-by-asset address that you can use to deposit your funds, and obviously we’ll control the private keys for those addresses in our cold storage. Beyond that, it’s really meant to be auditable, in a way that I think a lot of our previous iterations of cold storage were not. So from … sure we’ll talk more about the process in a [00:10:30] bit, but from KeyGen to the way we actually reconstitute private key material, we expect third party auditors to be a part of all of those steps, so that we can provide the visibility and the comfort needed to really large institutions. Interviewer: I was at consensus this year, and I heard a couple people talking and they were just scratching their heads about the custody issue. Because we hear over, and over, and over again that we need good custodial solutions before [00:11:00] institutional money can enter the space, and the conversation that I was overhearing was, in essence “What’s wrong, Coinbase has a vault and it’s never been hacked before, and institutions can sign up for it, and place funds in that vault”. What were those folks missing? What’s the perspective that makes sense of the scope and the importance of this problem? Interviewee: It’s a good question, and I think generally this idea that custody is what’s stopping institutional money [00:11:30] from coming in is a bit of red herring. I’ll come back to that in a second. But what’s primarily missing from just leveraging Coinbase vault, is a couple things. One, it’s fairly limited in how it allows you to interact with it. So it’s great at eliminating some insider threats, but not all. And certainly as you have a growing organization where you might need five or ten different individuals to interact with those funds, vault is not meant for that. It’s really meant for a single user’s holdings. Beyond that, I think the regulation, [00:12:00] or how that product is regulated is key. Also it’s audit-ability. So again, if you’re leveraging vault, what are you going to show to your fund administrator, to your fund auditor, even to your LPs, to prove to them that their assets are safe and that you’re accounting for them in the proper way. We have one customer that we’re really excited about, and they were telling us the way that they actually did this was they literally would show their fund administrator … they would open up the Coinbase app on their phone and show them the vault. Every quarter, that’s what they did. Clearly that … the fund administrator’s [00:12:30] not loving that as the solution, right. So I think it’s upgrading the audit-ability, the reporting, the financial auditing of the these platforms is pretty key. Interviewer: Let’s maybe shift gears and talk a little bit about your philosophy on custody, and the range of options that exist. I’ve heard Ledger speak about this, they have an approach. I was at another event for institutional investors and there was a company there that [00:13:00] decided to approach this problem by simply storing private keys for people, so it was kind of agnostic to what the actual tokens were. It was really about sort of safely, and in an institutional kind of way … in a manner that’s compatible with how institutions work, they were storing private keys for people. What you do think the spectrum of options are, and what are the different variables within that spectrum? As you sort of map [00:13:30] the custodial landscape, what are some of the different dimensions that exist? Interviewee: I love this question. There are a bunch of different dimensions, and there’s maybe three or four that I’ll key on. First thing I’ll say is, I’m really happy. To the end goal of putting this custody issue for the crypto-asset class to bed, I’m really happy to see so many different approaches, and groups tackling this problem. We have our own view on how the world’s going to shake out, but certainly we don’t think one view is going to win. I think multiple views will be right, and it’s [00:14:00] good that there’s so many different trade-offs and alternatives that are coming online in the market right now, so I think that’s a net win for this space. The two obvious dimensions for just evaluating a custody product, a crypto-custody product I should say, are first security, and asset selection. The good news is that most of the names you just mentioning, most of the names you’ve heard of, are using fairly conventional, fairly well-known means of storing crypto-assets. Typically this is going to be cold storage, some sort of air gap solution, probably leveraging some HSMs, [00:14:30] typically leveraging time locks, ways that folks cannot quickly move these assets. And those are time tested techniques, we know them to work very well, and typically when you hear about crypto hacks you’re hearing about exchanges, you’re hearing about hot wallets, you’re not hearing cold storage systems get hacked. So that’s great. And I think there’s just degrees to evaluate these groups across the security landscape. Certainly there will be more degrees forthcoming. The second is asset selection, and this is a tough one. Some groups are going the multi-sig approach, [00:15:00] and that means that multi-sig needs to be implemented natively on the chain, for them to offer a multi-sig wallet for that asset. We take a different approach which is sort of more similar to just storing the private key, splitting it up into a bunch of different pieces which allows us to be a little bit more Blockchain agnostic. But asset selection also is a function of your regulatory posture, that’s one of the dimensions I’ll come to in a second. How are you dealing with privacy coins if you’re able to, from an AML perspective? What about the security vs. non-security issue? Those come into play quite a bit when it comes to asset selection, and I [00:15:30] think if I was a fund, ultimately I wouldn’t want to have to pick multiple custodians, or I wouldn’t want to have to self-custody the bulk of my assets because my custodian doesn’t support them. So I think that will be a really key dimension here, probably in the next six to nine months as a lot of these custody offerings come online, and then vie for market position. The two that are maybe not quite as obvious, but in my mind more important, are going to be first vs. third party, so are you holding the keys yourself? Purely, in a first party offering, or is [00:16:00] your custodian holding all of the keys themselves, and that’s third party. Coinbase Custody takes the view that institutional custody needs to be solely third party. And that’s what our offering is today, it is just third party. We have the option to pivot, and we can actually share some private key material with our clients, so we could be somewhere in between, if there was a second party, or a one and a half party custody. We have that option available to us. But our view is from a fiduciary perspective, from a more traditional [00:16:30] financial perspective. What Wall Street is accustomed to is third party custodianship, that’s how every custodian works in the equities world, so we think that’s going to be a little more comfortable to most groups. I love that a bunch of groups are taking the first party approach, and I think that will resonate with a bunch of businesses. Ultimately, we find ourselves right now on the third party end of the spectrum. The last piece of the spectrum, is regulatory posture. So if, and then if, how, is your platform regulated? There’s a bunch of different offerings. Obviously if you’re first party, you’re more of a tech provider [00:17:00] to the fund, or the institution that’s holding crypto, so in that case you might be unregulated. If you’re third party, you’re almost in all cases going to be regulated so that you can service a broader client base, but you don’t have to be. And I think it’ll be interesting to see if there are some groups that take that approach. Interviewer: How would you describe Coinbase Custody’s regulatory posture? Interviewee: Our view is that, I think in line with our strategy, we want to be the most trusted. One of the ways that we’re approaching that is by being the most regulatory [00:17:30] compliant, and having an open dialogue with regulators such that we can bring those insights, and those dialogues back to our customers and help them make the right decisions for where and how they’re storing their assets. The way Coinbase Custody is going to market, we are partnering with a clearing broker dealer, so this puts us squarely under the SCC and FINRA regulatory regime. This is a challenge, because there’s not many … I actually don’t think there’s any clearing broker dealers that are custody and crypto today, in a third [00:18:00] party manner. So we’re trailblazing in a lot of ways, and that’s sometimes a challenge. It’s also an opportunity, gives us a chance to really educate the regulators, and also I think have really deep insight into where they’re thinking and where the world’s going to go, which ultimately we hope will benefit our clients. Interviewer: Man there is so much to dig into here, just on the topic of custody. Let’s just start off with what you were speaking about, you know with regards to your broker dealer. So why would a custody solution partner with a broker dealer? Interviewee: So the reality [00:18:30] is, in let’s call it Finance 1.0, you’re mostly … almost everyone interacts as a broker dealer, and interacts with broker dealers. I would say that is just the way most Finance 1.0 interactions happen. Even if you’re a hedge fund, you’re an LLC, maybe you’re an RIA, your prime broker is a broker dealer. And they’re probably on the back end interfacing with a custodian that is a clearing broker dealer. So I think that is just the most common framework, by which most financial institutions [00:19:00] work. And one of our hypotheses is the more sort of familiar we are to traditional financial institutions, the easier it will be for them to invest in the crypto-asset space. It’s obviously a big enough hurdle to invest in crypto-assets if you’re a more traditional asset manager, so the more we can look and feel familiar with them, that’s just less friction sort of that they need to overcome to enter the space. I think maybe the most interesting reason why we chose to go the broker dealer route is that the SCC ultimately is gonna have [00:19:30] final say on most of these assets. Many crypto-assets, if not the vast majority of them, will be securities, and that’s going to fall very squarely under the SCC’s regulatory control. And so we just think that’s the right place to be longer term. Interviewer: What I actually just heard you directly say is that it’s kind of a novel and new approach that’s very particular to this crypto-asset class, to have a custodian that isn’t a broker dealer, that normally custody and broker dealership is … these things are bundled together, and it’s actually [00:20:00] odd that they’re not, in crypto. Would you say that that’s true? Interviewee: … obviously odd that they’re not in crypto. Would you say that that’s true? Interviewer: I think that’s absolutely the case and it’s because our ecosystem and in particular that the crypto asset class is just so nascent that we’re having to start with these foundational building blocks, that again in traditional finance are taken for granted. There’s a reason no one talks about custody. They only talk in terms of brokerage or prime brokerage really because we’ve abstracted custody away. We’re starting over from scratch, and so we’ve gotta build base layers. Right now, custody is deposit, withdrawal, it is safe keeping [00:20:30] of crypto assets. Sooner or later, we’ll have solved that piece of the puzzle and we can build another block on top of it, which might provide margin finance, crypto loan, things like that. These are the more traditional financial services you might pull out of a prime broker. I expect to see that evolution in the space get built up over time, but we’re still a good ways away from it. Interviewee: Comparing coin-based custody to other solutions that exist right now that aren’t broker dealers or clearing broker-dealers, what can you guys do because [00:21:00] you have this partnership? What’s a feature of your product that isn’t present with competitors that don’t have a broker-dealer status? Interviewer: There’s a significant percentage of our listeners that are purely crypto-native and they happen to come into a lot of wealth. But they don’t really understand the traditional financial space, so they probably know what a broker-dealer is, they have no idea why a broker-dealer would be partnered with a custody solution, like, “Is someone gonna call the broker-dealer and actually buy crypto assets that are then directly [00:21:30] custodied with you guys?” What are the net new features that you guys get because of this relationship? Interviewee: Yeah, so ultimately all of this stems from the 1940s Advisory Act, which says, if you are a registered advisor I should say, then you have to custody your funds or securities with a “qualified custodian.” And there’s a bunch of different ways an entity can become a qualifies custodian. One is through a state trust, and that’s been the most popular route to date, for various crypto custody [00:22:00] offerings. Another is through a clearing broker-dealer, and there are others as well. Interviewer: Oh, got it. Okay. Interviewee: The clearing broker-dealer route, we believe is interesting. In the short term, what can we offer versus a state trust? There’s not much difference. If you’re literally just safe keeping, just depositing and subsequently withdrawing various crypto assets that you’re holding, being a trust versus being a clearing broker-dealer, there’s small, but not really material differences. One sort of obvious one, is civic protection. For crypto assets that [00:22:30] are deemed to be securities, you can get civic protection for those in a broker-dealer that you can’t in a trust. Longer term though, as we think more crypto assets come online and are qualified as securities, or viewed as securities by the SEC, there’s many more things that a clearing broker-dealer can do, since that’s just the predominant regulatory, or entity structure maybe, that most securities firms take. Couple examples there would be margin finance. So if you want to use some securities you’re holding as collateral to take [00:23:00] out a loan that you can use to buy more or do something else with, that’s a very common broker-dealer practice. Securities alone is another common one. So if we wanted to, lets say, take a bunch of the Bitcoin that is stored in coin-based custody and loan that out to short sellers, obviously to make a return on that, and then likely share back with our customers who actually own that Bitcoin, that’s something you can only do out of a clearing broker-dealer. Interviewer: In the short term, there might not be a huge difference, but when it comes to the long term product road map available to you, there’s just a lot more [00:23:30] space on that road map because of this status. Interviewee: Yeah, that’s our view. And then similarly, if we’re mostly interacting with either broker-dealers or firms that are used to interacting with broker-dealers, we think we’ll just be a more familiar structure to them. Interviewer: You said something I think I really interesting and speaks well to how you’re thinking about solving problems and scaling the technologies available to you, or the processies available to you, and that is that, rather than going the multi-sig route, that might be [00:24:00] native to a given bloc-chain, you guys have decided to go with a single private key, but you still have a lot of those safe guards in place. Can you talk about your approach to private keys? Interviewee: I can talk to it broadly. Our approach is to, in the simplest terms like the technology or the process that we do is, we take a private key, we split it up into a bunch of different pieces using Shamir’s Secret Sharing. Specifically so that we can have a consensus mechanism that is required to reconstitute, or bring that private key back together. Consensus [00:24:30] is, again, it’s one of those time tested techniques that is really necessary to securely store these assets. I think the difference between multi-sig and Shamir’s Secret Sharing to just split up your key into a bunch of different pieces is where does that consensus happen? Is that consensus actually enforced at the bloc-chain level? Or is it enforced outside of that? We take the latter approach, the theory being there, that we have a more singular, cold storage infrastructure that [00:25:00] can scale to pretty much all bloc-chains. I mean, ultimately you could just give us a blob of data, we could split that up into a bunch of pieces and store it. You had mentioned a group earlier that was just securely storing private keys on other’s behalf, we could do the same thing, actually. In this case, we actually generate the private key and the addresses ourself. We take a private key, we generate that offline in an air gap facility. That’s pretty cool, I can give you some details about that. That private key is split up into a bunch of different pieces. Those pieces eventually, a bunch of different things happen them, [00:25:30] various levels of encryption and so on. They find their way onto physical media and are distributed in vaults around the country, soon to be around the globe. When we need to reconstitute a private key, to actually sign a transaction to send assets out, there’s a bunch of different groups of people that are all involved and they’re all exclusive of each other. So if you’re a member of one group, you can’t be a member of another group. There’s a group that has access to the vault, that can actually go into vaults and pull out the private key shards. There’s groups that can decrypt those shards to [00:26:00] get back to the actual private key themselves. Then there’s actually the group that talked to the client and authenticates them in a bunch of different ways. And all of those people have to come together to reconstitute the full private key, and thus sign a transaction. But they’re split up, they’re geographically diverse. The groups don’t overlap so there’s no single point of failure, and the reality is, you can’t really talk to one person and know enough about the overall mechanism to figure out, “Okay, what other people [inaudible [00:26:28]” to actually [00:26:30] bring that private key back to completion to sign a transaction. Interviewer: It also seems to me, as someone watching this space, that the multi-sig technology is often less mature than the single-sig technology, if you will. I’m thinking about the parody hack, and other vulnerabilities that I’ve seen over time that generally the most tested in, more mature way to sign a transaction is with one single private key. [00:27:00] It seems to me like the benefits of this are not only scalability, but also security. Interviewee: We think so. Ultimately, cold storage is a combination of technology and process. I think, often times, anything that’s multi-sig can lull you into a sense of security. There’s lots of various techniques for securing private keys that can lull you into a sense of security, that if you don’t then have the right process around that, they’re just ineffectual. And I think multi-sig is a good example of that. Whether that’s multi-sig implemented [00:27:30] at the bloc-chain level, or some sort of M of N consensus model that you achieve through Shamir’s Secret Sharing. You still have to have the right process in place to bring either the different keys or the different key pieces together. Honestly, it might be more the process side that we’ve honed and learned and perfected over the last six years, than the technology side. I think there are some really cool tricks that we leverage on the tech side that do differentiate us from our competitors, but the reality is it’s not that different [00:28:00] from what a lot of other folks are doing. It’s the process around it, and I think a lot of the way we generate those keys, the way we store them … actually the physical nature, the very manual nature of the process that’s really unique and something that we’re very proud of. Interviewer: I know Xapo has done a bunch of PR around their facilities inside of mountains and stuff. If Coinbase were to do similar PR, what might people see in terms of the physical locations? [00:28:30] Would they also see bunkers and armed guards or would it be something different? What can you share with us about the physical aspects of your off bloc-chain process? Interviewee: First off, let me say I love Xapo, and I think they really set the stage, and the bar high for any subsequent crypto-custody offering, and still sort of love their offering and their devotion to Bitcoin to this day. I think they’re a really unique player and trailblazed a bunch for a lot of us to follow. What I can say is that our vaults are not quite the same. [00:29:00] We’re not actually in mountains, at least not yet, unfortunately. Although, maybe one day we will be. We’re typically in industrial grade vaults. What I mean by that is this would be a vault where if you could happen to look at the customer next to you, which you can’t, they would probably be storing gold bullion, or precious gems, something like that. These are vaults that have been around, at least the parent companies of them have typically been around for hundreds of years, storing these types of assets on behalf of their customers, who could be, usually [00:29:30] not high net worth, but could be high net worth banks. Any institution that might be holding precious metals, something like that. They’re obviously distributed right now in the US and soon to be globally. We think that brings a lot of peace of mind to our customers. Ultimately, the coolest part I think of our process, is our keygen ceremony. We have a mobile skiff environment, so what that is, is it’s a faraday cage, effectively, that we almost have on wheels, although it’s 400 pounds because the material to actually make this work is pretty heavy. So we have a faraday [00:30:00] cage that we set up, and then inside of this … I joke, it’s almost something out of Breaking Bad, the extent to … it’s kind of like a physics experiment, really is what’s going on in there. We have quantum safe random number generators, which are literally, if you’ve ever heard of the double slit experiment, the famous photon experiment, where you fire photons and they go through one slit or the other, we’re doing that in boxes. You count ratios of one photon to another as a source on entropy into your random number generation. I have so much fun geeking [00:30:30] out on this with our security team because they go so deep on all this. Even to the various brands of hardware that we might be using for various steps in that process. There’s dice involved as well. I’d say more so just for fun than anything else. I think we’ve got plenty of entropy but, if you imagine this mobile skiff environment that’s in undisclosed locations with a bunch of Coinbase security hackers inside running physics experiments, the end result is private key shards that end up in our physical vaults around the country, [00:31:00] it’s pretty fun. Interviewer: I’m almost picturing, what is it, a Rube Goldberg machine that generates entropy. Interviewer: I’m of the [00:32:00] opinion that Coinbase is the most important company in this space, and it’s really cool to hear about the innovations that are happening. I’m excited about the inflow of institutional capital that you guys are allowing in. Let’s talk a little bit about the service layer on top of Coinbase custody and what kind of value added services. In the past, we’ve spoken a little bit about the possibility of staking as a service, insurance, airdrops, masternodes, [00:32:30] you spoke to loans. What are the range of services that are available to people custodying funds with you? Interviewee: Great question. Right now, it is just the secure storage of crypto assets. So right now, Coinbase custody is going to market as cold storage as a service. Coinbase’s own take on cold storage of course. So you can deposit and withdraw crypto assets, and that’s actually it. But that’s because, again, this space is so nascent and the custody offerings are so new. We’ll obviously layer on much [00:33:00] more over time. As we look to the near term, maybe I’ll talk about services, just in terms of our roadmap. Certainly over the next six months, what we think is most important is asset diversity, so just adding assets to the platform. Coinbase is beating this drum loudly, that we need to be adding across all of our products, but in particular, we’re hoping custody can lead the charge in a bunch of ways. The second important feature for us, and this is more of a later 2018 item, but liquidity. Right now, getting assets out of cold storage is purposely long, arduous [00:33:30] and manual. We need ways for clients to get access to some amount of their funds more quickly, so you can imagine clients having a dashboard where they can dynamically manage their cold and hot funds with Coinbase custody. They might have 90 percent cold, but leave 10 percent hot, so that if there is some adverse market movement, something happens, they have some funds available, at least to react to that more quickly. Beyond that, we are really excited about some of the other products you mentioned, or services that you mentioned. I think far and away, the one [00:34:00] we’re most excited about is staking as a service. Ultimately, it doesn’t make a lot of sense for some entity who has large holdings of any asset, to just lock them up in vault and throw away the key for 10 years in the future. And to pay for that service, which really is what crypto custody is today. It’s expensive. Because cold storage is still a tough problem and there’s no other revenue streams available to groups like Coinbase custody. All we can really do is charge you to store your assets. So I think entities will by, necessity, look for ways to [00:34:30] monetize their assets. The most obvious one that seems to be on our horizon is staking. Staking as a service, us, Coinbase custody, building out the trusted infrastructure to facilitate that, and facilitate it in a way where our clients have complete piece of mind that their assets are safe and they’re earning a good return on those, relative to whatever amount of risk they’re taking. That’s gonna be one of the ways that custody offerings differentiate themselves over the next couple years. I think the groups that are able to get that right, both for themselves, and for their clients are [00:35:00] really gonna be the big winners. The other product you mentioned is crypto loan and this is obviously a huge need right now in the market place. Lots of folks want to short, not just Bitcoin, but other crypto assets, and there’s really no readily available ways to do this. Genesis is, I think, doing some cool things, from what I’ve heard, allowing some clients to short Bitcoin. I haven’t really heard of much else in the marketplace around this. I think there’s two problems. One, where are you sourcing your liquidity from, so where’s the actual Bitcoin that you’re loaning out to someone to short, coming from? [00:35:30] Are you having to buy that or are you a large custodian that can source that from your customers? If that’s coming from your customers, how are you giving them confidence that they’re Bitcoin’s not gonna be lost? That’s a real problem. And also, what’s the regulatory structure under which you’re doing this? There’s obviously a lot of risk with loaning these assets out, so how are you managing that? These are things that have been handled for a very long time under the broker-dealer regime. Securities loan is a huge part of the finance [inaudible [00:35:55], and we’re hoping to take some ques from that, to be able to roll that out in the future. Interviewer: Does Coinbase have a stated position on fractional reserve banking? I imagine that there’s a lot of creative things you could do with people’s Bitcoin down the road. A lot of banks only have one tenth of their stated assets under management. [00:37:00] I don’t even know if that’s the right term, but available to customers. What are your thoughts on fractional reserve banking, or is that just so far out into the future that a mature stance hasn’t really been developed? Interviewee: I think it’s probably too far out in the future for a mature stance to have been developed. What I can say, is I think typical third party custody … let’s say Coinbase.com, so Coinbase’s retail offering, I think that probably cannot be fractional reserve. That sort of defeats the purpose. Coinbase is a third party to securely store your [00:37:30] keys, and it’s an easy feaptic crypto on ramp. We’re sort of defeating a lot of the original purpose if we take that way. I don’t believe Coinbase has a stated view, but I don’t think that’s probably in the cards for our retail offering. For institutional offerings, I don’t think we’ll ever go as far as being a bank. What I can say is, again, the SEC, FINRA, through the broker-dealer, their broker-dealer registrations have really well-defined frameworks for how to think about loaning out assets, margin, collateral, things like that, and what are the appropriate amounts of collateral that [00:38:00] you need to put aside to achieve certain loans and ratios and things like that. In the near term if our institutional businesses are to pursue something or to pursue products along those lines, I think we’ll just follow the lead from traditional finance and leverage what’s already available in the broker-dealer world. Interviewer: How bout dirty money and fungibility? I’ve heard stories of people trying to move money into Coinbase that they acquired in honest ways, but being blocked. What kind [00:38:30] of checks do you have in place on Bitcoin coming that may have gone through mixers or been involved in underground markets and darknet markets and stuff? What are your policies there? Interviewee: I can’t get into all the nitty-gritty of how we go back and look through past transactions and things like that. We actually consider a lot of that to be intellectual property and we’re pretty proud of the practices we’ve developed. What I can say, is we are looking from an AML perspectives at all funds that come into Coinbase, both on the retail side and the institutional [00:39:00] side. And we might have various levels of … obviously, there’s different levels of suitability for the different types of clients, but I think, even on an AML perspective, we might have different levels of what’s acceptable. Interviewee: Again we want to be the most trusted and to be the most compliant so right now we’re shooting high bar for that. Interviewer: What about, with regards to the government coming in and asking funds to be seized or government reporting, I imagine you guys have spent a lot of time thinking through these issues. What are your approaches to government request for information and seizure of funds? Interviewee: Coinbase is always going to act in the best interest of its clients and I think we’ve sort of set a good precedent for this already [00:40:30] with regards to the IRS coming and asking for information on a lot of our clients, we push back on that and we feel like we got to a pretty good spot with the IRS in terms of what data we ultimately had to hand over previously. At the end of the day we are a U.S. business operating under U.S. regulations. If the U.S. government were to show up at our doorstep and ask to seize funds or I think less likely to seize funds but maybe to not let funds move off the platform, we would obviously comply with that. Interviewer: I do appreciate that when Coinbase did report to the IRS that it informed specific individuals [00:41:00] whose information had been reported that the information was reported. It wasn’t just given off without any status update. So that was, I think, a good way to approach it and I feel to the extent that it can act in the spirit of the sole cryptoverse that Coinbase has tried. But there are obviously limits and laws and stuff. Interviewee: Yeah, and I appreciate you saying that. I think this is something that’s going to play out over time and practice, much more so then in theory what any one company says they’re [00:41:30] going to do. Everyone’s going to build up a reputation of how they respond under particular instances and hopefully that’s how the market judges them. We know we still have work to do in a number of areas, but I think that we hope to be judged by our future actions more so then any one policy we might put out. Interviewer: I’d like to dig into maybe some of the lesser talked about aspects of custodianship. Do you anticipate finding yourself privy to information that maybe others wouldn’t have access to, like [00:42:00] certain funds, buying big allotments of coins or getting information on what the index fund is about to add next. What are some other sensitivities related to custody that the average person might not consider? Interviewee: Yeah, certainly and I think this is true of most custodians and prime brokers. Before one of your clients is going to launch a new product or trading strategy, they need to work out with you how they’re going to do that. So very natural you have to be in the loop on that. I think you hit the main ones right? Hey [00:42:30] we would like to add this asset. Obviously we just purchased a lot of one asset, we now need to move it over or we did move it over and obviously we see that sort of register on the platform. And then I think broadly we have very … we try to think of ourselves as a partner, not as a vendor to our clients. So we want to have open dialogue with them about what their current and future needs are as well as, really so we can match up what our current and future roadmap is to make sure we’re meeting their needs and they’re not having to go look for someone else to custody their assets. In the course of those conversations, [00:43:00] you tend to get a sense of how folks are thinking and looking at the world right now and what they’re going to be thinking about and needing in the future. We have really strict rules around, well just around how we treat that information. I think, this is not something new, right? We have been at the same problem at Apex. I would talk to [inaudible [00:43:17] and then I’d fly across the country and talk to [inaudible [00:43:19]. There’s really good ways to handle this, but in particular at Coinbase what we’re doing right now, we’re working as quickly as we can to segregate all of our institutional businesses and put up the right Chinese [00:43:30] walls between them, so that there’s no improper information sharing. One of the, I think a concern that I get a lot is, hey you work with Reuben who runs Coinbase Asset Management. In fact he had asked us to come on together, normally we would love to do something together, but the realities of our business is we really should not be interacting that much because we don’t want to accidentally share some information that we shouldn’t and so that’s just the reality of business right now. Interviewer: How do you think about adding new assets. For Coinbase, for the [00:44:00] consumer product. We’re talking about fiat onramps and we’re talking about customers, but when it comes to regulated funds and institutions that for whatever reason are looking to maybe custody something that may or may not be a security, that’s okay with you. They’re regulated, they’re making their own decisions. Is it purely based on your ability to securely custody the funds and customer demand or are there other considerations coming in to play similar to those employed by GDAX? Interviewee: That’s [00:44:30] a good question and I can’t commit on any asset in particular, you didn’t ask me that anyway. Broadly our public digital asset framework still does apply to all assets that we’re going to add to any of our products. That being said, you hit on some of the obvious issues at play. Suitability for coinbase.com is very different then suitability for Coinbase custody that’s only custodying for sophisticated financial institutions holding funds for credit investors, for example right? Those just should not be the same bar. [00:45:00] Similarly, we don’t offer by cell through Coinbase custody, it is just the secure storage of these assets, so our bar from a technology perspective is also different. Doesn’t necessarily mean it’s lower, it just means it’s sort of different in how we think about these assets. Certainly we still have digital asset framework, we still want to run everything through that because we want to have a public opinion on, is this asset distributed, how is the team, how were funds raised, is it a security or not, that’s actually … we have to treat [00:45:30] it internally a little differently in terms of how we’re going to report things and deal with it even though it’s the same sort of security and ultimately the end reporting to the client’s going to be the same. So all those things are important and we still have to, well we think the right thing to do is work through that framework in all cases. Interviewer: I imagine you can’t answer, but I gotta ask, as a side note here, Ethereum classic, can we discuss Ethereum classic or is this totally not something we can discuss? Interviewee: I think all of our official communications from that will come from twitter [inaudible [00:45:59]. Interviewer: [00:46:00] Okay, alright. That’s fine. Interviewee: I will tell you, I’m excited to add Ethereum classic to Coinbase custody. A lot of index funds, gray scale has a large Ethereum classic holding. That opens up more of the market to us. Generally I’m going to be excited to add almost any asset because I think that just broadens the amount of the market that Coinbase custody can serve, Ethereum classic in particular I think brings some cool clients to the platform. Interviewer: I was at Consensus Invest and it was really interesting how many people at that event had [00:46:30] Zcash and Ethereum classic. In fact at one point, a speaker asked people, how many people here hold Ethereum and almost everyone raised their hand. Then the speaker said, keep your hand raised if by Ethereum you meant Ethereum classic and almost everyone kept their hands up, and I think that really speaks to the advocacy of Barry Silbert’s and gray scales Ethereum classic trust and all that that they’ve really done a good job of proselytizing that to institutional investors. Maybe that has something to do, but [00:47:00] everyone can speculate. Well, I’ll wait for the official communication, but certainly Zcash and Ethereum classic have done a really good job with penetration among institutional investors. Is there another question I should be asking about custody that I haven’t touched on, or that we touched on briefly, but maybe should do a deeper dive on? Interviewee: There’s two really, insurance and then by extension, why do folks continue to say custody is the gaining factor to institutional money coming in and I think part of that is random balance sheet which [00:47:30] I think folks sort of expect someone like Bitco or Coinbase Custody to trust to have insurance if you are state street. You have a trillion dollars on your balance sheet, there’s the greatest insurance policy that you’re ever going to have, although maybe not [inaudible [00:47:45] back stop there. The second I think is segregation, which is, how is Coinbase Custody remote from the other Coinbase businesses and how is it protecting it’s clients assets from any risks that might cross over from those businesses. Interviewer: [00:48:00] So Sam, let’s talk about insurance for a second. One of the reasons why I personally start off with Coinbase was I saw that the funds were insured and I remember back in the day, Zappo actually had insurance and then they eventually rolled it back and there was one other player in this space, I forgot who, that had insured funds that eventually dropped their insurance. Can you speak to the history of insurance in this space [00:48:30] and the role that that plays in solving the custody problem. Interviewee: There’s been a really colored history of insurance action. I think you sort of nailed it. Actually I was on a panel with Ted, the president of Zappo just a couple of weeks ago and he had a really fun antidote about how they had this thesis on insurance and they actually spent a bunch of time building out, ultimately self investing to self insure and ultimately they don’t feel like it’s been super beneficial to their business in terms [00:49:00] of winning new clients. And I feel similarly in a lot of the conversations we have in the marketplace, we get asked constantly, do you have insurance? The answer is yes, and we sort of check a box and move forward. There’s not much more digging in there. The reality is, if you think of the craziness that’s going to have to happen for an insurance claim to pay out, and the digital asset of the [inaudible [00:49:21] space, I can’t even imaging it. But there’s so many different angles. Think about it, is it theft, is it cyber theft, is it physical theft, was it lost, was it damaged, was [00:49:30] it insider theft. All of those risks are typically written under different policies in more mature businesses. In our businesses you have to sort of bundle all those together. I think it makes the reality of a claim very challenging. But what’s interesting is most folks seem to just want to know that there is insurance and they don’t dive deeper. I will echo a lot of what Ted said about how Zappo’s thinking about insurance and how others are, which is Coinbase Custody is covered under Coinbase’s global insurance policy and there’s [00:50:00] some details about that on our website if you want to read about it. We get to go to market with that. I think that allows us to check the box. If and when the market demands something more specific or maybe even more broad or larger, then we will react to that and we’re actually constantly in communications with the various underwriters and folks that might be able to help us there. It has been eye opening to see that it does feel more like a marketing or almost a client acquisition need. Maybe that’s almost where the cost should be allocated, cause that’s what you need to get folks in the door. Interviewer: So [00:50:30] not a lot of follow up questions when you say you have insurance? Interviewee: There’s not. And I think that question goes away. I don’t think anyone asks State Street for example if they launch a crypto custody offering or fidelity. I don’t think they get asked if they have insurance and it’s because their balance sheets are so big, folks believe that there is an implied backstop to any losses that will come first from those groups balance sheet and then if needed, potentially from the fed, depending on who it is that actually … which [00:51:00] institution you’re actually working with. Interviewer: That’s a fascinating conversation. I’ll have to dig into the terms of service or the specifics around it. You mentioned Reuben. I first approached you and Reuben about doing a joint interview and then I got a note from Reuben saying that shouldn’t happen. At first I was like, did I do something wrong, was I approaching this the wrong way, is the copyright, all that stuff. But it turns out that this is being done to preserve the balance of power there or the [00:51:30] separation of different businesses. Can you speak to how Coinbase thinks about it’s different business units and the function that that serves? Interviewee: Yeah, so there’s really two dimensions across which we’re going to think about this, and the first we’ve sort of been talking about and played out with Reuben and I not being together on a podcast. Which is we want to be really respectful of our clients, of the fact that we’re probably privy to nonpublic information with regards to their products, their businesses, etc. and it’s just the more that we’re separate [00:52:00] both logically and physically, the less opportunity there will be for something to happen there. So as a good example, Reuben and I don’t even sit next to each other. We sat next to each other the first couple of weeks when I joined Coinbase because we thought that would be helpful in terms of spinning up. What we quickly realized was that I could be on the phone with one of Reuben’s competitors and with no intention to share information with them, but he might overhear something that’s inappropriate, so first step is just physically we need to sort of separate out and luckily we’re expanding office space [00:52:30] pretty rapidly here in San Francisco so we’re able to do that. And a lot of our institutional business too will spin about of New York and Chicago, so there will be more physical separation there. But the second and maybe the more important one, at least in my view from a custody perspective, is the separation of risks. I think that investors in [inaudible [00:52:48] funds are paying to take on certain risks and ultimately where their aspects gets stored, there can be risks that are introduced there that are not obvious. So if coinbase.com, for example, were to get hacked, [00:53:00] there should not be crossover risk from that hack to Coinbase Custody, right? Similarly, if [inaudible [00:53:06] Coinbase Pro and Coinbase Prime, has some sort of event. Let’s say it’s not a hack but maybe there’s a night style trading error where we incur hundreds of millions of loses and those businesses are going to be going under, that risk also shouldn’t carry over to Coinbase Custody and tie up custody customers assets. So we also separate these businesses as separate entities so that we are completely … [00:53:30] I mean, Coinbase Custody exists only to safe keep our customers assets right now. There is no other business activity happening within that business unit. It is completely separate from prime, pro, coinbase.com, etc. specifically because we don’t want any of those risks to carry over and we want our customers to know, hey, ultimately the risk that they’re taking is just the risk of securely storing crypto assets and then hopefully we do that in a really best of class way. Interviewer: So there’s no risk of assets stored with you to [00:54:00] cover losses or other parts of the business or GDAX. That makes a lot of sense. To provide people with a specific example, like I’m sitting here trying to imagine a scenario where you would be talking to a customer and Reuben would overhear something that would present a conflict of interest. Can you share what kind of scenario might generate that kind of conflict? I just can’t even imagine … I’m probably just not being very imaginative, but what’s an example. Maybe [00:54:30] something so absurd that it wouldn’t speak to a real situation? Interviewee: Well I think the simplest and most direct is we’re constantly asked about our roadmap and timing to add new assets. And in some cases once we’re … we can’t be much more specific then I was earlier, but we broadly know and can characterize how Coinbase Custody is going to approach adding assets. We have an internal metric, which is we want custody of 99% of the [inaudible [00:54:56] market cap. I don’t know exactly when we’re going to get there and I certainly don’t know in what order we’re going to get there, [00:55:00] but when clients ask about an asset I can sort of characterize, “Okay, well here are the things we have to think about for that.” And we talk through some of these earlier. If Reuben where to be sitting next to me for example, or in the next conference room over and lets say our walls were a little too thin, he might be able to surmise, “Okay, well Sam was talking to so and so today and he was talking about [inaudible [00:55:18], to use the famous Coinbase example that always comes up. That might give him some insight that either custody is about to add ripple, or that some of his competitors are going to add ripple to their funds and he [00:55:30] needs to get ahead of that in a way that he wouldn’t otherwise be able to if he didn’t hear that. I’m sure there are more direct examples that I also can’t think of right now, but even indirect. We don’t even want that possibility to be feasible. The more we can just separate ourselves so that … I myself, we have enough going on across our business if I have to sort of be looking over my shoulder every time I’m on a conversation to know who’s around me and what I can and cannot say, that’s just too much to worry about, so I think the more separation you provide logically and physically [00:56:00] the easier it is to not slip up. Interviewer: Conceivably Coinbase Custody could have a customer that’s in index fund that potentially competitive with the Coinbase index products, and that’s something that you wouldn’t want to share because you’re separate business units and the interest of your customers come before the interest of the index fund, for example. Interviewer: You ready to head into the second part of this? Interviewer: So [00:56:30] this concludes part one of this fascinating conversation with Sam McIngvale with Coinbase Custody. Part two is almost as long as today’s episode and just as good. I look forward to sharing it with you. See you next week. That’s it for this week. To sign up for our free crypto investing newsletter, listen to other episodes or get the show notes from this episode please visit [inaudible [00:56:57]. I also invite you to check out the start [00:57:00] up that funds this podcast, Nomics, spelled N-O-M-I-C-S, at nomics.com. Finally, if you got value from the show, the biggest thing you can do to help us out is to leave a five star review with some comments and feedback on iTunes, Stitcher or wherever you listen to podcasts. Thanks for listening and see you next week. Clay Collins: [00:03] Welcome to Flippening, the first in original podcasts for full-time, professional, and institutional crypto investors. I’m your host, Clay Collins. Clay Collins: [00:10] Each week we discuss the cryptocurrency economy, new investment strategies for maximizing returns, and storage from the front lines of financial disruption. 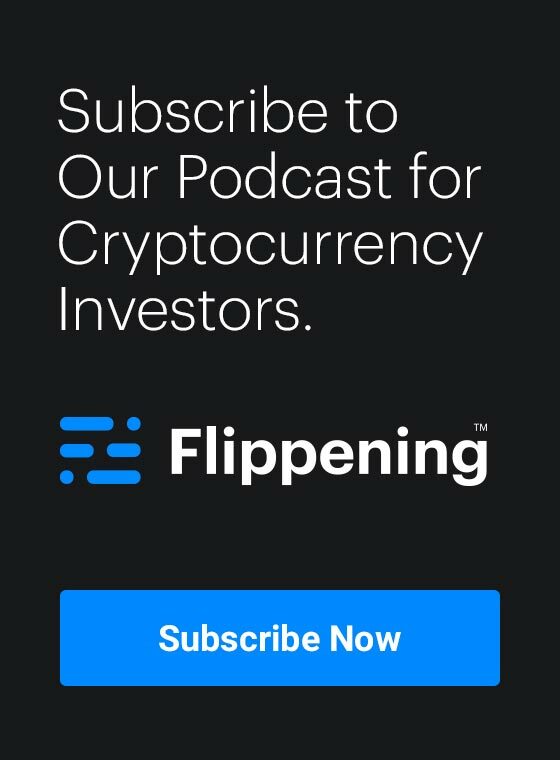 Go to Flippening.com to join our newsletter for cryptocurrency investors and find out just why this podcast is called Flippening. Speaker 1: [00:25] Clay Collins is the CEO of Nomics. All opinions expressed by Clay and podcast guests are solely their own opinion, and do not reflect the opinion of Nomics or any other company. This podcast is for informational and entertainment purposes only and should not be relied upon as the basis for investment decisions. Clay Collins: [00:40] Hey, this is Clay, and I’m about to get into part two of our conversation with Sam McIngvale from Coinbase Custody. Before I do that, however, I wanted to provide two announcements regarding Nomics.com, the company that produces and funds this podcast. Clay Collins: [00:55] Announcement number one is that the development of Nomics.com and the Nomics Commercial API continues to develop at a fast clip. Last week I announced that we hired Tyler, our new head of front end development for Nomics.com. Clay Collins: [01:09] This week I can announce that Brandon, our new creative director and product designer has joined the team, so expect our API docs, our API signup flows and website to start looking much, much better. Brandon and I worked in the past on several conversion rate optimization projects, so if you find yourself purchasing our paid API plan when you didn’t before, it’s because his spell is on you. Clay Collins: [01:31] The third hire I have to announce is our lead backend API developer. This position has been filled, William will be joining our team the first week of November and will be 100% dedicated to our API product, adding more endpoints, surfacing more data, and all the things that you’ve been requesting for. So the pace for our development is accelerating, and if you have any feature requests for our free API, our paid API Nomics.com, or the advertising platform for Nomics. com, please let me know by emailing us at contact@nomics.com. Clay Collins: [02:06] So that’s the first announcement. The second announcement is that I am hard at work developing the next Flippening audio documentary. If you’ve heard the security token documentary we produced a few months ago then I think you’ll enjoy what we have coming. With this new documentary we’ll be covering all forms of crypto exchanges. It’ll be an exploration of the topic. We’re going to be covering centralized exchanges, decentralized exchanges, security token exchanges, exchanges for rates, non-fungible crypto assets, derivatives, money markets, debt markets, and much, much more. It’s going to be a six to eight part series, and we’re looking for a single title sponsor if possible to really just sponsor the entire thing. We’re also looking for folks to sponsor individual episodes. Again, if you’re interested in that, contact me at contact@nomics.com. Clay Collins: [02:57] What you’re about to hear is part two of my conversation with Sam McIngvale, who runs Coinbase Custody. Coinbase Custody’s clients include polychain capital, multi coin capital, autonomous partners, and Walden Bridge Capital. Coinbase Custody’s mission is to make digital currency investment accessible to every financial institution and hedge fund in the world. Like I said before, I’ve been to several crypto conferences for institutional investors and heard a bunch of boring conversations about custody. Our last episode is not one of those boring conversations. Our previous conversation with Sam has gone on to become one of my favorite episodes, and it is my producer, Airyson’s favorite episode so far according to a message he left for me the other day. If you haven’t heard it, stop what you’re doing right now and download the previous episode, which is part one of this conversation with Sam. Clay Collins: [03:51] In the episode that you’re about to hear, which is part two of our conversation with Sam, we discuss one, an overview of Coinbase’s suite of institutional product offerings, two, why consumer products in the crypto space are optimizing for getting the greatest number of individual users, whereas institutional products are designed around servicing the greatest amount of capital. Three, how Coinbase prime operates as a service layer on top of Coinbase’s products for institutional customers. Four, Coinbase’s forthcoming OTC offering, five, the need for additional order types for crypto assets, especially for institutional investors, and six, a discussion of Coinbase’s soon to be shuttered index fund. We also discuss how Coinbase markets, which provides a shared pool of liquidity for all of Coinbase’s products is both an internal service provider to the rest of Coinbase in a product available to market makers and high frequency traders. I should mention that if you want to discuss these topics, or this podcast episode, feel free to join us on our telegram group at nomicstelegram.com. Clay Collins: [04:58] This episode is brought to you by the generous support of Aurora Dao. Aurora is a collection of blockchain applications and protocols that form a completely decentralized financial and banking platform. Founded by a group of blockchain enthusiasts who aspire to see digital currency flourish, Aurora aims to provide these decentralized financial solutions to anybody in the world regardless of location and status, Aurora’s first product, Idax, is the first realtime decentralized exchange, and currently the number one DAP in the world by daily users, transactions, and volume. Idax achieved early success utilizing a hybrid design which carefully balances the speed and user experience of centralization with the security of blockchain. However, this is only the beginning. Idax will evolve into a fully decentralized exchange through Aura staking, that’s their token, Aura, A-U-R-A. This will allow users who hold in stake Aura tokens to run specialized nodes that perform various exchange functions. In return, these token holders will be rewarded with the fees collected by Idax, as well as all future Aurora products. Learn more by visiting auroradodaw.com, spelled A-U-R-O-R-A-D-A-O, again, .com. Clay Collins: [06:14] And I should mention that Idax is the very first exchange to do a deep data integration with nomics.com, there’s a press release about that on our blog that you can check out. Clay Collins: [06:26] Okay, let’s get this started. Here without further ado is part two of our conversation with Sam McIngvale from Coinbase Custody. Clay Collins: [06:33] You mentioned the separation of the legal entities under the Coinbase umbrella, and so I think it would actually be a great time for us to talk about the suite of institutional products that Coinbase is rolling out. So here are the ones that I’ve heard of. I’ve heard about Coinbase custody, which I kind of see as the bedrock of Coinbase’s institutional offering. If you can’t do custody, what else can you do? There’s Coinbase prime which is a prime brokerage offering. There’s the index fund, there’s Coinbase markets, which it’d be fun to talk a little bit about, and then there’s Coinbase pro. Have I covered everything there, or is there anything else I’m missing in terms of institutional offerings? Sam McIngvale: [07:29] No, you’ve got it right. There is one more group inside Coinbase that we talk about frequently which is our growing institutional coverage team. So this is a single team that currently spans most of those products focusing on things like sales, client service, research … I’m sure I’m missing a few things there but we’re sort of taking a cue from the traditional Wall Street banks and prime brokers who would have groups like sales traders as well as research analysts sort of at their client’s disposal, to give them either color on the market, whatever, as well as sales and other things like that, and building up that group in New York so that they can span a number of these offerings, and really bring … We want to provide solutions, not just products across our institutional businesses, and that’s sort of the core thesis underneath the institutional coverage team, so you’ll probably hear about Coinbase’s institutional coverage team more in the future as well as listed out next to some of those businesses, but we really view that as what’s going to be a differentiator, it’s going to be a core service layer on top of all of those businesses that hopefully can help just institutional clients I think feel a little more at home across those businesses. Clay Collins: [08:38] Does the coverage group consist of account reps who can help an institutional customer navigate the suite of offerings and decide what constellation of services would best match their needs? Sam McIngvale: [08:50] Yeah, absolutely. That’s one great use case. Others might be what new products or services are you trying to bring to market as part of your business? How can we partner to help you build that? Oh hey, Bitcoin happens to be down 10% today, feels like a common theme much more recently. But you know, what are you guys seeing and hearing in your OTC desks, and what other sort of client chatter can you share? What about just core research? Hey, we’re trying to develop a sort of independent thesis to help our asset management group come into the space. Most asset managers need some thesis before they start putting certain bets and positions on. Maybe we’re thinking about it this way, what have you guys learned being in the space for the last six years that can complement that or help us think about this in a particular way such that we can bring it to market? Clay Collins: [09:35] It seems like one of the differences perhaps between the consumer product and institutional products is that consume products in a lot of ways are optimizing for getting the greatest number of individual people involved in the space, whereas institutional products are maybe designed around getting the greatest amount of capital involved in the space. Sam McIngvale: [09:59] It’s a really astute operation. I mean, ultimately if you think of an 80/20 rule I would rather have 20 clients, I think most of our institutional businesses would rather have 20 clients that are generating the vast majority of our value and ultimately revenues than more. And these businesses are still fairly nascent obviously, JEDAX which is now predominantly Prime and Pro has been around for some time and is pretty mature, but from [inaudible [00:10:22] perspective, I can tell you some months from now we will be looking at all of our clients on probably at least a monthly basis to say, okay, what are the costs that you’re incurring to Coinbase custody to service your business, and then what are we getting? What are the benefits from that so we can actually have more of a return on cost across each customer. But yeah, that’s exactly right. I think it’s very easy for institutional clients to be much more costly than they seem at first blush. So sort of product client fit more so than product market fit is really important. When clients try and go outside of your particular product’s bounds, that can be really costly. Clay Collins: [10:56] Especially when there’s a lot of just kind of ad hoc solutions and expensive band aids on things that involve a lot of just hours and custom whatever. Sam McIngvale: [11:05] Absolutely. It’s just not a good way to scale a service business. Clay Collins: [11:08] So let’s dig into each of these products. So we spent a great deal of time talking about custody, and that was a fascinating discussion and maybe the deepest discussion of the space that I’ve heard thus far, so I’m really happy with that material. Let’s talk about the prime brokerage product. Could you speak a little bit about what would be offered under that umbrella? Sam McIngvale: [11:31] Sure. So again I think you have to put all of this in the context of brand new asset class. So we’re starting with really foundational layers to how you would compare Coinbase prime to maybe more traditional prime brokerage and then we’ll layer on features and services over time. So what prime is about right now, is it’s about a service layer for our really top institutional clients that are coming into JEDAX, what will soon be Coinbase markets. It’s a nice way for them to interface with the exchange, understand what’s going on with hey, we’re providing this sort of liquidity, here’s what we see if we sort of tightening up our orders or broaden our orders, Coinbase, you know why is this happening? It’s a good way for them to really understand at a low level how to interact with our exchange so that we can be sure they’re getting all the value they need out of it, and they’re also providing the right value that the Coinbase exchange needs from them so that we can service a really broad range of customers. Sam McIngvale: [12:24] We’re pretty proud that right now we have a really heterogeneous order book, and that there are everyone from just individuals like you and me, to more professional day traders, to actually the biggest name brands in high frequency trading all trading in one spot, that’s pretty cool. We want to preserve that as much as we can, and so interacting with our top clients to make sure they’re getting what they need out of it, but also we’re getting what we need out of it is important. So right now prime really starts as that service layer, and there’s two near term features that are coming online. The first is an OTC offering, so we’re pretty excited about that, and frankly we’re a little late, I think, to the space. There’s been some really fantastic OTC desks, probably Cumberland leading the way, but also Circle as well. So we’re excited to bring that feature to our clients. And the other will be, I think, just broader execution services generally. Right now most of the exchanges, most of the order types are very simple. It’s predominantly market orders and maybe some limit orders, or some good [inaudible [00:13:20] orders. Sam McIngvale: [14:00] – advance, so ways to use your crypto holdings as collateral to get more leverage, as well as crypto loan, so we can loan out crypto items for the purposes of short selling, so that clients can actually borrow crypto from us to short sell, or we can take crypto from our clients, whether that’s coin-based custody or coin-based prime, something like that, and then loan it out. Sam McIngvale: [14:20] The way that will probably work is, you can imagine custody would be a really large book of crypto holdings that are for the most part locked away in cold storage. We might come up with some sort of agreement directly with coin-based prime, so they can be a front end to loan that out. Maybe coin-based custody is loaning it out directly, we’re not exactly sure how it’s going to play out because it’s still a good ways in the future. Clay Collins: [14:39] But suffice to say, coin-based prime would be definitely a separate business entity from coin-based custody. Is that correct? Sam McIngvale: [14:46] It already is today, yeah, it would be completely separate. So any relationship between coin-based custody and coin-based prime would be a relationship between coin-based custody and one of its clients. Clay Collins: [14:55] I imagine there’s probably a little less friction if someone wanted to do something on coin-based prime with funds held by coin-based custody. Is that correct? Would there be less paperwork to sign, or is it fully the same process? Sam McIngvale: [15:30] And there should be no reason that that client should have to withdraw those funds from coin-based custody and transfer them to coin-based prime. Obviously. Sam McIngvale: [15:39] So we’ll find some way to facilitate that, I don’t know exactly how it’s going to work quite yet. Maybe that’s coin-based custody white-labeling the OTC services from prime, or vice versa. Ultimately, I think coin-based custody, again going back to our client independence, we need to be agnostic across exchanges and OTC providers too. Sam McIngvale: [15:58] So I’d really like if that client’s preferred OTC vendor is Cumberland or Circle. They’d be able to do the same thing and not have to withdraw that crypto out of cold storage, and we just have a settlement cycle that we’ve spun up with Circle or Cumberland so we can settle that trade later in the day, everyone has full faith that it’s gonna get done, but ultimately we’re providing a very low friction and efficient means of execution for the client. Clay Collins: [16:23] Let’s talk about the index fund for a second. Does that fall under the umbrella of institutional offerings? I saw the minimum investor amount is $250,000. Is that part of the institutional offering, is that where it’s housed? Clay Collins: [16:38] Hey, this is Clay cutting in here from the editor’s booth to mention that on October 12, coin-based announced that it was shutting down its index fund, which by the way required a minimum investment of $250,000, to shift its focus to a new coin-based bundle product, which allows investors to buy five crypto-assets with one click. According to media reports, the index fund is being shut down due to lack of interest from the market. Please keep this context in mind when listening to the rest of this conversation. Clay Collins: [17:07] Okay, back to Sam. Sam McIngvale: [17:09] It’s actually not, it’s housed outside of that. And it’s housed outside of that for a lot of the reasons we touched on earlier. The index fund is in most cases directly competitive with a lot of the clients of coin-based custody, coin-based prime and markets. Sam McIngvale: [17:23] So we’re also selling to different groups. So the institutional coverage group that covered all the institutional business is selling to the peers of coin-based asset management. Whereas coin-based asset management tends to be selling more to either asset allocators, so groups that are investing in the funds that we’re selling to across custody and the other institutional businesses, or high net worth individuals. Sam McIngvale: [17:44] So the customer base is also different. At the end of the day it’s all more institutional money, versus retail money, if that makes sense. But again, we’re really concerned about the conflict of interest with coin-based asset management being too close to the other institutional businesses. For that reason, even though it does have a more institutionally feeling client base, if that makes sense, we deem it to be outside of the institutional side of businesses. Clay Collins: [18:09] Let’s talk about coin-based markets. On the article I read about it, it described coin-based markets as providing a centralized pool of liquidity for all of coin-based products. Will customers ever interface directly with coin-based markets, or is coin-based market an internal service provider to other businesses within coin base? Sam McIngvale: [18:31] It’s both. Customers will definitely interact directly with coin-based markets, but only a certain class of customers. So high volume market makers, we use the term high frequency traders, if we want. Sam McIngvale: [18:41] But certain institutional liquidity providers will interface directly with coin-based markets, likely in a co-located manner. So they’ll have a cross-connect port that plugs their server directly into a coin-based market server, to eliminate latency there. And that’s how most exchanges work today. So that’s really what markets is trying to provide, it wants to level up the exchange infrastructure, not just for coin-based custody, but hopefully to get that to set a high bar for the industry, so that groups that are used to facing off with the CME, the NASDAQ, the Nice, the other international exchanges that are well-known, can then turn and look at coin-based markets, and it looks and feels very similar, and they can deploy a lot of the various training strategies they had previously, directly into markets much more seamlessly. Clay Collins: [19:26] So would a customer of coin-based markets be purchasing data, co-location, access to servers? Is there a market maker discount, or is there a maker-taker scheme, or rebate scheme in place? What is someone buying as a customer of coin-based markets? Sam McIngvale: [19:42] That’s a great question. I will stay pretty high-level so I don’t misrepresent anything, but for the most part, we’re a maker-taker scheme, so the pricing that is in effect for coin based prime previously [inaudible [00:19:54] will roughly look the same. Sam McIngvale: [19:56] What really the high value clients, the folks that are gonna come direct to coin-based markets, they’re providing liquidity to that venue for all the other customers. That’s what their end goal is and that’s why they’re valuable to coin-based markets, because it makes that venue mush more attractive to other folks that are trying to trade. More liquidity I think is almost in all cases a good thing. Sam McIngvale: [20:17] So really what they’re providing, the way the markets have evolved with the advent of co-location and I’ll use the term high frequency trading, I don’t mean that in necessarily a flash boys sense, but more so in just a, we trade pretty quickly and mostly algorithmically. Sam McIngvale: [20:33] There are co-location services, there’s certain data centers that most of the large exchanges operate either themselves or in partnership, where it’s just very- most of these are in Chicago or New Jersey. That’s where you go, and you buy a rack and you can, it’s some quick, small fee if you want to spin up a cross-connect cable from your server into one of those racks to any of the other exchanges that happen to co-locate there. Sam McIngvale: [20:56] So it’s not coin-based markets specifically that will be offering those. You’ll be paying coin-based markets for co-location services, but we’ll be in one of those spots where all of this happens. So right now I know the team there in Chicago who’s built this out and is actively evaluating which one of those data centers we want to go to, and is talking to a lot of our clients to figure that out. Clay Collins: [21:15] How does coin-based differentiate conceptually the difference between value added market makers and rent-seeking market makers? Sam McIngvale: [21:24] It’s a great question, it’s a question I don’t have a great answer for. I’d be interested to know if other folks who coin base have spent a lot of time thinking about this. My hunch is that again, the space is so immature that there’s probably not very sophisticated models to date for how to differentiate between the two. Sam McIngvale: [21:41] I could be way off base on that, and if one of the listeners thinks that’s the case, I would love to hear some feedback or some direction on it. But broadly right now, my view is that the more folks and the more institutionally folks that come into the space, so someone that has had a career either providing liquidity, being a market maker, being a high frequency trader, or just as an asset manager, maybe portfolio manager. The more of those folks in the space I think is a net win for crypto-assets broadly. Sam McIngvale: [22:07] So I’m of the opinion, and maybe naively so, that just more is better right now and we’re probably not at a maturity level where we need to be differentiated between the two. Clay Collins: [22:17] I understand that perspective. I’m sure there’s plenty of things that coin-based markets could do that would generate a lot of revenue, but might not necessarily be adding net new value to the space, there just could potentially be rent- taking activities, you know, you said something interesting which is there wouldn’t be an additional charge to get access to the data, but coin-based markets would be providing the server in the data center, where people generally get access to this kind of data. Clay Collins: [22:43] So it doesn’t sound like the goal is necessarily to charge for privileged access to data, it sounds like the spirit of this is really to source as much liquidity as possible for that space. Sam McIngvale: [22:57] Yeah. So I should clarify, I expect that coin-based will have some fairly strict commercial terms around usage of its data. Not necessarily to the extent of, I am a liquidity provider on coin-based markets. You’re obviously going to have access to the order book and can leverage that data for the needs of providing liquidity back to the venue. But if you were to take that data and go display it on your website for all to see, that would probably be a breach of the commercial terms there. Sam McIngvale: [23:28] So I think market data, you look at the major equities exchanges, they make so much money off access to market data. I can tell you, working in that industry for a long time, we had to really strictly control who could even see market prices. As an engineer working on trading systems, you thought it was outrageous, but it just wasn’t worth the cost because it was so expensive. Sam McIngvale: [23:48] And I don’t know, I don’t expect that space has changed at all, in the last few years. I remember we wrote software just to audit ourselves so we could evidence back to the exchanges how few people actually had access to live market quotes, because they were so expensive. Sam McIngvale: [24:02] I don’t think anyone has the intention of trying to go to that level. I think there’s just too many other problems to solve. The margins upstream are still so big that it’s not worth it. I do expect terms around commercial usage of market data to firm up and strict up probably in the next 18 months, and then I do suspect that there will be some stricter terms or pricing around how to get access to that. More from a retail perspective though, if that makes sense. Clay Collins: [24:30] Is there a reason to restrict real-time programmatic access to the order book other than just that it is a potential profit center? Sam McIngvale: [24:40] No, there’s really no reason to restrict that. And I think that’s a lot of the point of coin-based markets, is to help build out the right level of infrastructure so that we can scale to a much larger extent than our current infrastructure can. Sam McIngvale: [24:53] It’s hard to imagine building tech- when [inaudible [00:24:57] started a couple years ago, no one, I think could foresee what’s happened in the last year. That technology really needs a major overhaul. And coin-based markets is spinning up in Chicago, we’re sourcing engineering talent from the top high frequency trading firms in Chicago, from the exchanges in Chicago. Sam McIngvale: [25:14] I’m really excited about a lot of the talent that’s coming onto that team to build out, I think what they’re going to build could serve as a top of the line equities exchange. Probably in the near term. So it’ll be great to level up that order book across all of those dimensions. Clay Collins: [25:29] When we were talking earlier, you made reference to what IEX is doing in regards to their speed bump and not necessarily trying to democratize access to data, but to level the playing field and to make sure that everyone has access to roughly the same latency when it comes to data. Clay Collins: [25:47] Is coin-based markets doing things that are roughly in that spirit? Sam McIngvale: [25:51] It’s something that we’re actively looking at. What I can tell you is, backing up to what I said earlier, we really value the fact that there’s a single order book right now that individuals at home who are hobbyists can trade alongside really professional individuals, all the way up to actual high frequency trading firms. That doesn’t exist in many other financial markets. Sam McIngvale: [26:13] So that’s pretty cool. And we would like to preserve the spirit of that as much as we can. So in that vein, looking at all sorts of stuff, from speed bumps to other ways on how wide or how thin markets can be, that we think will adjust. The reality is, the speed bump is not the only lever knob that’s appropriate to keeping more democrative or open access to an order book. Sam McIngvale: [26:35] So we’re gonna make sure we explore all of those, and we’re actually actively hiring for a head of market structure. So if anyone out there goes deep on that, they should check out the coin-based careers page to come work on coin-based markets. Sam McIngvale: [26:46] Shameless plug there, sorry. Clay Collins: [26:49] No, I would love to see a flight of talented engineers who does some of these more established exchanges and markets to coin-based markets. I think that’d be a great thing for the industry. Sam McIngvale: [27:00] Clay, it’s happening. People ask me all the time about, what’s going to happen with crypto, where it’s going? I have no idea. As I said earlier, I bought my Bitcoin in 2015 and promptly sold it when it doubled in price, so clearly I’m not the best prognosticator for this. Sam McIngvale: [27:14] The thing that amazes me constantly, two things. One, just the amount of investment going into infrastructure here. So even just other custodian offerings. I am psyched and motivated by how much investment is coming into this space to build out other custody offerings, that’s what I have my polls closest to. Sam McIngvale: [27:31] But so much investment into just base-level infrastructure right now is happening, that I don’t think is obvious unless you’re on the inside building that. Sam McIngvale: [27:39] The other piece is, the flight of Wall Street talent that is coming to coin-based but also other big named crypto exchanges, crypto firms, it’s just on. And it’s really happening. And it’s hard for me to understand how that is anything but positive for the space. I’m really excited about it. Clay Collins: [28:00] -the one we’re currently experiencing, whenever I start really questioning what’s happening, I look to the talent involved, and it is just complete brain drain, from traditional finance, from vertical SaaS, from Silicon Valley, from traditional web services, and so my investments follow the talent. Sam McIngvale: [28:17] Yeah, and I’ll expound [inaudible [00:28:18] ,you know, a lot of folks have opinions that we shouldn’t rebuild Wall Street, and I very much agree with that. There’s a lot for us to do to sort of move the world, and move our society forward. All that being said, I think there’s going to be leveling up crypto broadly, whatever that means, whatever your end game is, whether that’s BitCoin taking over as the predominant store valuer, or something else, I think it has to be a step wise function, and in the next two to three years, an obvious step is finding ways for institutional finance to come invest and partake in this asset class, and that’s not readily … I think it is happening in small pockets, but it’s not happening broadly, and it’s not readily available to these firms. Sam McIngvale: [28:57] So I think in a lot of ways it makes sense to build infrastructure that looks and feels familiar to Wall Street in the next two to three years, level up two or three more times, level up the space two or three more times, maybe hit a couple trillion in market cap across crypto assets, and then really let that fuel the next wave of investment. What we would call the utility phase, in the true open financial system at Coinbase, where we spread to use cases that we really can’t even imagine today. Sam McIngvale: [29:23] That’s sort of my thesis on one of the better ways the space can evolve. Clay Collins: [29:27] I spend a lot of time thinking about what is the proper allocation for a product. Like how much of a product should be just providing compliance as a service, versus maybe net new value, or new innovation to the space, and I think businesses that are built entirely on providing compliance as a service, or providing X plus compliance, I think they’re gonna be hurting ten years from now. At the same time, I think if business don’t do that, they’re not gonna find themselves with much growth at all, unless they’re catering just to the wild west. Sam McIngvale: [29:58] I agree, and I love the Tesla secret master plan analogy, right? Which is find a product that works today, and leverage that to invest in your next product, and then leverage that to invest in your next product. If you don’t continuously invest and reinvent yourself, you shouldn’t expect to exist in ten years. Clay Collins: [30:13] I think Netflix did a really good job of that. You know, when they first started, it was just DVDs that anyone could access anywhere, to digital distribution, to original content, and those are very different businesses, but the value at the end of the thing is the same. Clay Collins: [30:27] Okay, so just last question with regards to Coinbase markets, how many order books exist? Is it the OTC desks, and then Coinbase Pro? Or are there any other collections of order books that exist at Coinbase? Sam McIngvale: [30:41] Good question. Those are the three, I think, logical entity … well, so Prime, Pro, and NOTC. Obviously once Markets is up and running, Markets clients can come directly to Markets itself. So you’ll sort of have liquidity plugging in from those different entities. We tend to think of order books more like a BTC USD pair. Those are the logical entities that I think will be interfacing with Coinbase markets. Sam McIngvale: [31:18] All of those are going to be plugging into a single order book, right? So Coinbase Markets, let’s say, won’t host a BTC USD order book. Markets, Clients, Prime, Pro, and potentially OTC will all be plugging into that single order book. Clay Collins: [31:32] So OTC is really just the execution of a special kind of order on the existing order book, right? It’s like a block trade. Sam McIngvale: [31:40] It could be, and it could be … yeah, usually it’s a large enough block size order that it makes sense to execute off the exchange, so that you’re not moving the market considerably, and sort of hurting yourself. So I think in most cases that could get executed off the exchange, but in a lot of cases it won’t. The sort of point of starting with a more manual OTC desk, is to let someone who thinks and deals with liquidity, has done that for their whole life, figure out where the best place is to go with the fill that the client needs. Clay Collins: [32:10] That was really helpful, to think of it from that perspective, from the order book perspective. Coinbase Pro is essentially GDAX. Is there anything new to share around Coinbase Pro, post the name change, or is it essentially just GDAX with a new name? Sam McIngvale: [32:27] I think it’s GDAX with a new name, and a new emphasis behind it. So maybe nothing new from a feature product set that I can share right now. I expect to really start to see deviation between Pro and Prime, probably in the six to nine month scale. There are sort of new internal teams that are aligning to those business. There’s new roadmaps, new priorities. I know Coinbase Pro is really excited, and thinking a lot about how to cater to the crypto enthusiast, the crypto trading enthusiast, and that’s, I think, longer term, gonna be a different set of needs than the institutions that Coinbase Prime is servicing. So I think, expect to see really good things to come, but probably a little bit down the road. Clay Collins: [33:06] Is Coinbase Pro almost like the prosumer version of Coinbase Prime? Sam McIngvale: [33:11] I think so. If what you mean there is if you just take Coinbase Prime clients, and replace them with individuals, versus financial institutions, then yes. Clay Collins: [33:21] I struggle a lot when I look at the different exchanges, and the ranking of exchanges by volume. GDAX, with very few assets, manages to stay usually somewhere in the top 15, which is pretty remarkable, given that they’re not adding 12 new markets a day. How do you think about the addition of new assets? Is that purely a regulatory exercise? I think one of the criticisms of Coinbase is that it’s been kind of slow to add new assets. What are the factors that are at play when it comes to adding new assets? Is it primarily technological? Is it primarily regulatory? Is it combination? What’s the real bottleneck at the end of the day, when it comes to adding new assets? Sam McIngvale: [34:06] The reality is it’s a complex combination, and we’ve tried to codify that as best we can. We think we have codified that really well in our digital asset framework. Regulatory concerns are obviously really big, but protecting our customers, and only bringing things online that we understand the technology, the risk, the security, all those are really important, so I think it’s a complex problem, I think that we are excited to accelerate the addition of assets to all the Coinbase products, but it’s one we also want to think about in a really well defined way, in a way that we, frankly, have been able to get a lot of feedback on, and that’s what the digital asset framework is meant to be for us, so that’s the framework we’ll continue to use as we think through it. Clay Collins: [34:47] When I look at the exchanges in the space, and how much volume they’re doing, like I was saying, I think GDAX is usually in the top ten, sometimes it’s in the top 15, what do you think those rankings miss? Do you think the biggest thing that they’re missing is the fiat to crypto on-ramps that account for a whole lot of volume that really isn’t accounted for, because it isn’t included in GDAX market data? Clay Collins: [35:15] When I look at volume rankings, I never feel like Coinbase is properly represented. Do most rankings … like I don’t know that Coinbase actually releases data on their fiat to crypto markets, and is that essentially why? Sam McIngvale: [35:28] No, I think we do, although I haven’t dug into this enough to know. I think you sort of hit the nail on the head earlier, which was it’s sort of remarkable GDAX is able to maintain such market share when it has so few assets actually listed on the platform. And I think the reason that happens is one, because we are probably the predominant U.S. dollar on-ramp into crypto, especially for the states, and we’ve been able to provide that in a really trusted and easy way for a long time, so that’s just a lot of our brand. Sam McIngvale: [35:58] Best part is, because we’ve taken a very regulatory first, compliant first, approach to this, a lot of large financial institutions, that only want to work inside that environment, are only trading on GDAX, or they’re trading on GDAX and a few other exchanges. So we’re able to capture, I think, a high value piece of the market from the approach that we’ve taken. Clay Collins: [36:19] Maybe the last thing to talk about is your relayer, Paredex, I know it’s not part of the institutional offering, but what was Coinbase trying to accomplish with that acquisition? Are you looking to do more in the decentralized exchange space, is it really just to have a toe in that space, you can monitor and stay current? Or is there a deeper strategy that’s going to emerge and maybe spread out to other offerings that you currently provide? Sam McIngvale: [36:48] Great question. I think the deeper strategy is to help create an open financial system. And I know that sort of sounds, it’s obviously the company line, but the reality is, everyone knows these are early days for crypto, so what, and where, and how … I don’t even want to say what wins, but what becomes the best leverage to help create an open financial system I don’t think is … no one can say with any certainty what that’s going to be today. Sam McIngvale: [37:10] One of the cool things about Coinbase is we have a lot of resources that we can leverage, now, to broaden our approach, and to broaden … really just to try a bunch of different things to help bring about an open financial system. I think that’s sort of the core way that I think Coinbase thought about Paradex, was that look, there’s just some really interesting stuff happening over here, and it could really be on to something. Sam McIngvale: [37:34] One of the cool things that I get in my job is I sit two desks down from Jacob Horn who’s really helped spearhead that acquisition, but is really well known, I think, in the [inaudible [00:37:44] and distributed exchange space, and I get to learn a lot from him, and probably be more plugged in to that space than I should be, quite frankly. Sam McIngvale: [37:52] I bring that into it just to sort of really make clear that Coinbase is not valuing … yeah, I think the institutional businesses are key to helping us get there, and I think they’re really maybe a two to seven year step towards this open financial system, but there’s lots of other ways Coinbase is thinking about this, and investing, and growing, and ultimately that is what Paradex is about to me. Clay Collins: [38:23] So that concludes part two of this conversation with Sam McIngvale, from Coinbase Custody. I’m off to work a little bit on our cryptocurrency exchange documentary that we’ll be releasing here in a couple of months. See you next week. Clay Collins: [38:39] That’s it for this week. To sign up for our free crypto investing newsletter, listen to other episodes, or get the show notes from this episode, please visit flippening.com. I also invite you to check out the startup that funds this podcast, Nomics, spelled N-O-M-I-C-S, at nomics.com. Finally, if you got value from the show, the biggest thing you can do to help us out is to leave a five star review with some comments and feedback on iTunes, Stitcher, or wherever you listen to podcasts. Thanks for listening, and see you next week.